LANSING — Flint Mayor Karen Weaver faced a recall election, 17 challengers and negative TV advertisements levied by dark money groups. In the days before the Nov. 7 election in Flint, the groups started airing attack ads against Weaver. One organization named Opportunity for Michigan alleged that police response times in Flint had grown while Weaver increased her personal security detail. Another organization named Great Lakes Renaissance Fund brought multiple allegations against Weaver. 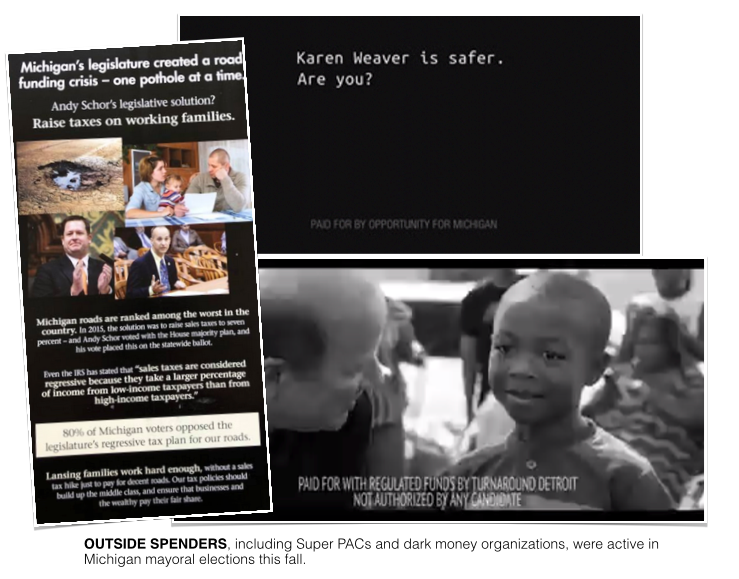 The ads against Weaver are examples of the role of outside spenders in Michigan elections. These spenders can raise unlimited amounts money, and their efforts to influence voters can be difficult — and sometimes impossible — to trace. This fall, mayoral elections in three of Michigan’s largest cities saw at least some involvement from outside groups. In two of the cities, the groups showed up in the final weeks before the election, providing little time for their targets to respond. And they were apparently also able to keep their donors secret, meaning the public couldn’t vet who was funding the ads they were seeing just before Election Day. Groups whose ads expressly tell voters to support or oppose a candidate have to officially form as political action committees (PACs) and fall under state campaign finance disclosure rules, meaning they have to provide at least some information about their donors. But groups that provide the public with information about a candidate without telling viewers how to vote — regardless of how slanted the information may be — can generally avoid disclosure. Two groups that ran negative ads about Flint Mayor Karen Weaver apparently avoided disclosure. While Great Lakes Renaissance Fund’s ads told viewers to “head to the polls and let your voice be heard,” Great Lakes Renaissance Fund isn’t a PAC at the county-level in Genesee County or at the state level. So MCFN could find no campaign finance disclosure for the organization. Usually, but not always, nonprofit organizations file incorporation paperwork with the state, but Great Lakes Renaissance Fund doesn’t show up in the state’s database of registered business entities. According to to filings with the Federal Communication Commissions (FCC), the group reserved about $13,942 in TV ad time in the days before the election. TJ Bucholz, a Lansing-based political consultant, is the executive director of the Great Lakes Renaissance Fund, which he described as a progressive organization. The organization “supports issues and causes that are in line with our progressive ideals,” he said. Campaign finance disclosures filed by the Michigan Pipe Trades Association Super PAC show the Super PAC gave $20,075 to the Great Lakes Renaissance Fund in 2017. The PAC’s treasurer is Harold Harrington, who’s listed as the business manager for the Flint Area Plumbers & Pipefitters Local 370. Asked about Great Lakes Renaissance Fund and the TV ads, Harrington said he wasn’t sure of any TV ads being run against Weaver. Harrington did mention literature being distributed. Harrington also referenced the fact that for one phase of a major pipe-replacement campaign in Flint, a requirement that certified plumbers do the work was lifted. “We’re against any organization, any candidate or anybody else that wants to weaken plumbing laws in the state of Michigan,” Harrington said. Bucholz declined to provide additional information on the organization’s donors. But the potential details surrounding Opportunity for Michigan’s interest in the mayoral race are murkier. The organization reserved about $31,704 in TV ad time, according to FCC filings. A copy of the organization's ad viewed by MCFN focused on police response times. According to FCC filings, the group’s treasurer is Robert Patrick Armiak III, but there is no record of a business entity by the name Opportunity for Michigan in the state’s business registration database. 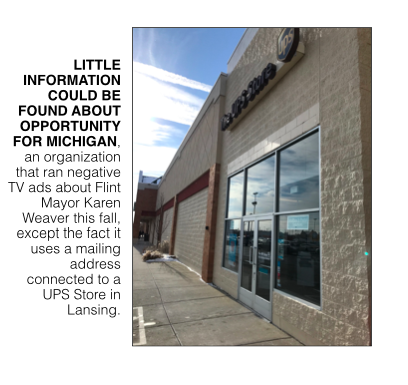 The address listed on FCC filings for Opportunity for Michigan belongs to a UPS Store in Lansing, about 50 miles from Flint. Despite the negative attacks, Weaver survived the recall election this fall with more than 50 percent of the vote. Second-place finisher Scott Kincaid, a Flint City Council member who received the support of labor groups, received about 32 percent of the vote. The spending by the groups in Flint was just a portion of the overall money in the race. Weaver’s campaign reported raising $146,694 leading up to the election. Kincaid’s mayoral campaign reported $110,476 in fundraising. State Rep. Andy Schor cruised to victory in the race to be Lansing’s next mayor this fall against Lansing City Council member Judi Brown Clarke. Schor, whose campaign reported raising $361,628, got about 72 percent of the vote. However, in the days before the election, a group called Capitol City Leadership Project funded a negative mailer against Schor and positive TV advertisements about Brown Clarke. MCFN tracked about $5,815 in spending on broadcast TV ad time by the organization, according to FCC filings. The mailer criticized Schor for supporting a 2015 statewide ballot proposal to increase the sales tax to boost funding for roads. It’s unclear how much was spent on distributing the mailer. 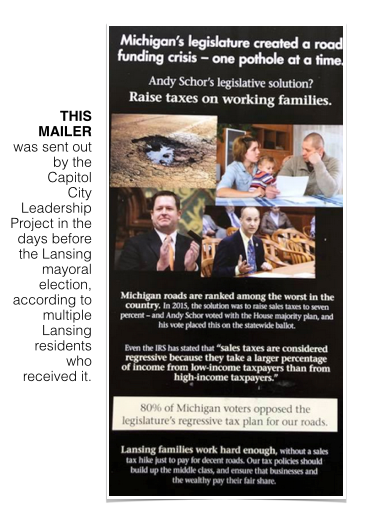 “Tell Andy Schor, we need fair taxes not sales taxes,” the mailer said. The organization’s efforts didn’t fall under Michigan’s campaign finance disclosure requirements, and MCFN could find no public record of the organization filing business registration paperwork with the state. Documents filed with the FCC about the TV advertisements listed lawyer G. Michael Hocking as “president, secretary + treasurer.” Hocking didn’t return multiple requests for comment. Schor said he was disappointed to see the advertisements roll out in the last week before the election. “The voters of Lansing won’t be deceived by that,” Schor said. Schor’s campaign, which raised $361,628, had a significant money advantage in the race. Brown Clarke’s campaign raised $91,454. The money was easier to trace in Detroit, where Super PACs dominated the outside spending in the 2017 race to be mayor of Michigan’s largest city. Super PACs have to file regular disclosures, providing some information about where their money comes from. Incumbent Detroit Mayor Mike Duggan won re-election easily against state Sen. Coleman Young. Aiding in Duggan’s victory was a major financial advantage. 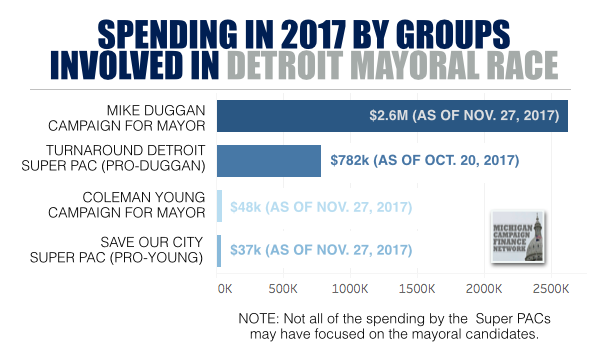 Duggan’s campaign reported raising about $4.3 million between his last election in 2013 and the 2017 election. It reported spending $4.1 million between the two elections. The Super PAC spent a large sum of money running positive TV ads about Duggan, but because the ads didn’t expressly tell viewers to vote for Duggan, the Super PAC apparently didn’t have to specify how much of its spending on ads was focused on backing Duggan. As of Oct. 20, the Super PAC reported spending $579,129 on advertising and mailings. Additional information on the group’s spending could become available at the end of January when it files its next quarterly disclosure. Jason Gourley, the Super PAC’s designated record keeper, declined earlier this fall to answer the question of whether the Super PAC was spending money on advertising about any official other than those involved in the Detroit mayoral race. Large contributions funded Turnaround Detroit, who disclosed its donors in regular reports to the Michigan Secretary of State. The Michigan Regional Council of Carpenters gave $150,000 over the summer. This fall, Roger Penske, of the Penske Corporation, gave $250,000. Powering the Economy, a Super PAC connected to the Detroit Regional Chamber of Commerce, gave $125,000. And Central Transport, one of Matty Moroun’s corporate identities, gave $100,000. Turnaround Detroit’s spending dwarfed the spending of the pro-Young Super PAC, Save Our City. Save Our City reported $37,157 in contributions. It ran a small number of negative advertisements against Duggan. Young’s campaign reported raising $52,780 for the year.